﻿﻿When there’s not enough for all, who gets water from the Colorado River? ﻿﻿﻿﻿﻿﻿﻿﻿﻿﻿﻿As the population of Texas grows, so does our need for water. But with the glass half-empty, who will have a say in distributing what’s left? It’s a dilemma that’s pitting Texan against Texan in a war with no real winners. Since 2007, Texas has been experiencing one of the worst droughts in history. In the Colorado River basin, Central Texans are sweltering under more triple-digit-temperature days, and rice farmers downstream have now experienced a third consecutive year without water to irrigate their crops. No flooded rice fields means more than just no crops for farmers; it means no waterfowl hunting on those usually plentiful migratory stopovers. 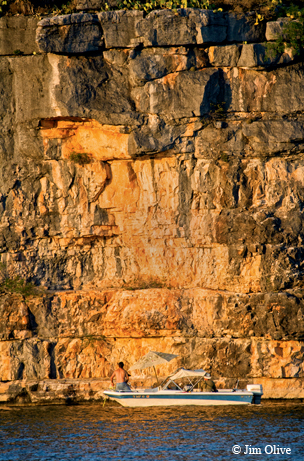 The ongoing drought has created real conflicts among water users. Cities need water for their municipal water uses and economic security. Farmers, ranchers and commercial fishermen need water to produce food and fiber. Industry and other businesses need water to remain economically competitive and provide jobs. Waterfowl need water for the wetlands they use as stopover sites when migrating. Fish and other marine creatures need water from rivers to refresh the bays. Recreation-based businesses like marinas and guide services also depend on healthy lakes, rivers and bays. For people living around these lakes, they are more than swimming holes and sunset scenery — these lakes are the sources of their drinking water. Furthermore, lakes, rivers and estuaries all depend on sufficient flows of good quality water to remain healthy. With no significant relief in the foreseeable future and a finite amount of water available, how will we resolve these conflicts? Whose needs take precedence? The Colorado River begins in the Llano Estacado in Northwest Texas, flowing 600 miles through Ballinger, Austin, La Grange, Columbus and Wharton to Matagorda Bay, where entanglements of marsh grasses weave nests for fish fingerlings to grow to their adult size. ﻿The Colorado River fills the Highland Lakes (above) and serves the needs of Central Texas while also providing water for irrigation of rice fields downstream (below). In the case of the Colorado River, the Lower Colorado River Authority (LCRA) has water rights allowing the use of more than 1.5 million acre-feet of water per year from Lakes Buchanan and Travis. The LCRA manages this water under a carefully crafted set of operating rules called a Water Manage­ment Plan that considers input from stakeholders (including the Texas Parks and Wildlife Depart­ment) in an effort to balance the needs of communities, businesses, industry, utilities, farmers, wildlife and the environment. This plan must be updated periodically and approved by the TCEQ. Lakes Buch­anan and Travis play an important role, storing Colo­rado River inflows for use by the myriad user groups. Cities have “firm” water contracts with the LCRA, meaning their water supply cannot be cut off, while farmers have “interruptible” contracts, in which they get their water more cheaply but also can see their water reduced. During dry times, the LCRA is allowed to reduce the amount of water available for agricultural use, mainly rice irrigation, as well as for the environment. If the drought continues to worsen, the threat of suspending flows to the bays as well as the farmers grows greater. In late May, TCEQ told the LCRA that it should revise its water plan to be more stringent when it comes to downriver releases in times of drought and even under normal conditions. Drought conditions have begun to rival the worst drought in recorded history in the lower Colorado River basin. This isn’t good news for Central Texas lake communities like Burnet, Marble Falls and Kingsland. Austin, the LCRA’s largest urban customer, is one of the fastest-growing areas in the country, putting further strain on water resources. More than 100 people move to the Austin area every day. Residents need water for everything from tooth-brushing to lawn-watering. 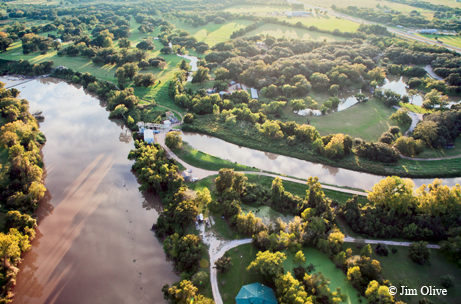 ﻿﻿Above: Canals divert water for irrigation in Southeast Texas. Below: The drought has taken a toll on Central Texas lakes. In response to the severe, persistent drought conditions last September, LCRA filed an application with TCEQ seeking emergency relief by not sending fresh water down to Matagorda Bay, as required by the Water Management Plan. Freshwater inflow amounts, delivered on a seasonal schedule, are vital for maintaining the proper salinities, nutrients and sediments necessary for a productive estuary. Before the TCEQ Commission could act on the request, heavy rains fell downstream of the Highland Lakes. The Halloween 2013 floods provided beneficial inflows to Matagorda Bay, and LCRA withdrew its request. Unfortunately, the rainfall did not substantially increase the amount of water stored in the Highland Lakes, and the painful decision was made to seek permission from TCEQ to suspend spring water deliveries to most agricultural users, affecting crops and wildlife. For farmers, suspending flows feels as if they’re losing ground in an uphill battle that could have permanent results. The rice industry in Texas traces its roots back to the 1850s. Haskell Simon, a third-generation rice farmer, recounts the history of rice farming in Matagorda County. Texas ranks as one of the nation’s top rice-growing states, and most of the state’s rice is grown near the Colorado River. However, rice is a water-intensive crop. In fact, farmers use substantially more water from the lakes than the cities do. Agri­cultural customers used 67 percent of the water taken from the Highland Lakes in 2009. That’s changed now, with water cutoffs in place. Agricultural water use from the lakes went from 367,920 acre-feet in 2009 to 22,346 acre-feet in 2013. Muni­cipal use has held fairly steady, with 110,150 acre-feet in 2009 and 133,317 acre-feet in 2013. The drop in water has affected both farmer and fowl. The connection between rice farming and waterfowl is vital, says Kirby Brown of Ducks Unlimited. Hundreds of thousands of waterfowl count on the rice fields for food and habitat, and the fields provide critical stopovers for migrating ducks and geese. The water serves the needs of both agriculture and wildlife. Brown says farmers are getting more efficient with water. 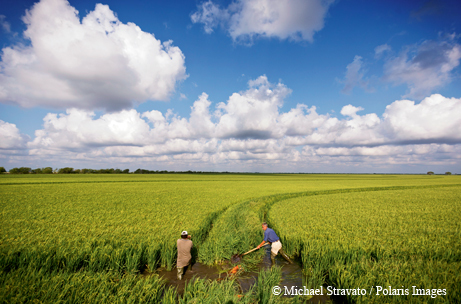 “Rice farmers, who through their farm activities create the important rice prairie wetlands habitat complex critical to waterfowl and waterbirds, have significantly improved water conservation over the last 30 years,” he says. Only time will tell what the effect will be on these ecosystems and their inhabitants. Not only does the rice itself provide food for the birds, but the irrigated water serves a second purpose when it reaches the Gulf. Simon explains exactly how these farms benefit the bays. The estuarine habitat and wetland of Matagorda Bay is one of Texas’ most treasured fishing spots. Just like the lakefront businesses, the economies in many of the townships along the bay rely on fishing and bay-related industries. 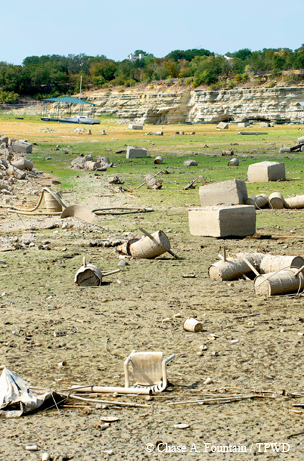 In the bays, water hasn’t dried up like it has in parts of Lake Travis, leaving mud puddles and fish skeletons, but the land and its people are still threatened by an ever-diminishing water supply. In a drought, as the rivers run low, less fresh water reaches the ocean, causing an imbalance of salt water to fresh water in coastal estuaries. This brackish water is crucial to the survival of fish species, but balance is key. Balance is also key for those who will decide how to try to allocate this state’s water. It’s a serious dilemma for which there are no easy answers. Except one. Rain. Lots and lots of rain.